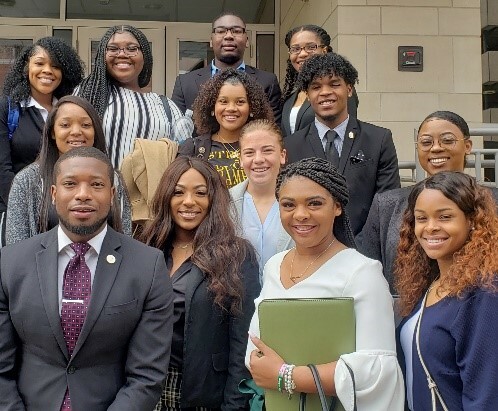 GRAMBLING LA – April 10, 2019 – Because of the joint efforts of Grambling State University and the University of Iowa College of Law, 19 students from GSU (17 Criminal Justice Majors, 1 Mass Communication Major, and 1 Business Management-Marketing Major) were selected to attend the “Iowa Law Bridge Program” in Iowa City, from March 29-31. The University of Iowa College of Law (Iowa Law) hosted GSU students as well as those from other universities from around the country. Throughout the three-day program, students were exposed to and advised on: life as a law student; how to develop a strong law school application; a mock law school class; ways to develop strong legal research, analysis and writing skills; and factors to consider when applying to law schools and ultimately choosing one, along with many other items. It is undeniable that America needs more lawyers of color. Emphasis on and demand for better representation of women and people of color across state bars throughout this country has grown from municipal attorney’s offices to the legal departments of Fortune 500 companies. Thus, it is incumbent on historically black colleges and universities, like Grambling State, to train the next generation of young attorneys to meet the growing demands for diversity in the legal field. GSU is poised to do just that. “The Bridge Program,” designed to introduce diverse students to law school, kicked-off with opening remarks and a legal exercise using critical race theory narrative analysis from Prof. Toussaint Romain, a public defender, activist, and adjunct professor of Criminal and Constitutional Law at the University of North Carolina at Charlotte. The program offered a way for the university to get to know the students better and to better acquaint them with Iowa Law in hopes that some or all of them will attend. All of the students expressed their appreciation of the experience and the impact the trip to Iowa made on their decisions to pursue a juris doctorate. In addition, the students indicated that the Bridge program activities were eye-opening experiences that they will never forget and how they plan to use all of the information they learned to begin their law school application process. This sentiment was echoed by the Iowa Law administration and staff, who noted the GSU students were a welcome addition to this year’s Bridge Program, and they encouraged each student to apply to Iowa Law. Professor White and Atty. Lodge will continue working with Iowa Law to develop additional opportunities to make pursuing a law degree more accessible to GSU students and other students of color. The following students represented GSU at the Iowa Law Bridge program: Chandlier Armstead, Zephany Banks, Mackisha Brumant, Samanthar Corbette, Jazmine Cyprian, Ashley Dabney, Shanya Espy, Sarah-Renee Garner, Jazmine Hunter, Stephanie Lewis, Sage Nelson, Nerisa Newton, Andra Richards, Keyunte Richards, Faron Rush, Javante White, and Charysma Wilson. This entry was posted in academics, campus, events, studentlife on April 10, 2019 by Greta Carter.